One hot July afternoon in1895, Emily Coombes used the landlady's key to open a locked bedroom door in an east London row house. Inside she discovered the rotting body of another Emily Coombes, her 37-year-old sister-in-law, sprawled on the bed and crawling with maggots. Beside her was a knife, and a truncheon was on the floor. The stench was overpowering. There was no question about who killed her. Robert Coombes, aged 13, immediately confessed: first to his aunt, then to a police constable, and finally to a police sergeant. The boy's statements were cool and consistent. "I did it," he said to the constable. "My brother Nattie got a hiding for stealing some food, and Ma was going to give me one. So Nattie said that he would stab her, but as he could not do it himself he asked me to do it… . I did it with a knife, which I left on the bed. I covered her up and left her." There was some question about how to apportion the blame. Was Robert alone guilty, or was Nattie, aged 12, an accessory to murder? What about John Fox, the unemployed, slow-witted dockworker the boys had recruited to help them get money and food during the days between the murder and its discovery? How much did he know? Was he involved? And there were myriad questions about what had been going on in Robert's mind. 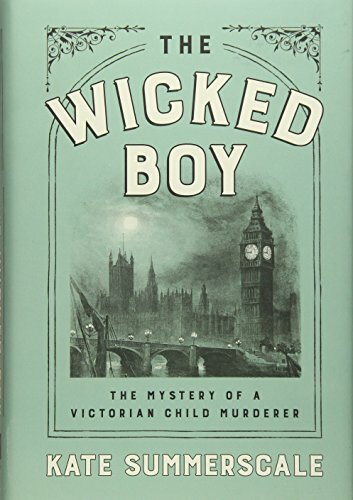 Why would a boy—neither a trouble-maker nor noticeably troubled—commit matricide? Why did he then spend more than a week and quite a lot of money at cricket matches, the theater, coffee shops, and a fishing expedition? Why did he appear unconcerned and even cheerful at his trial?